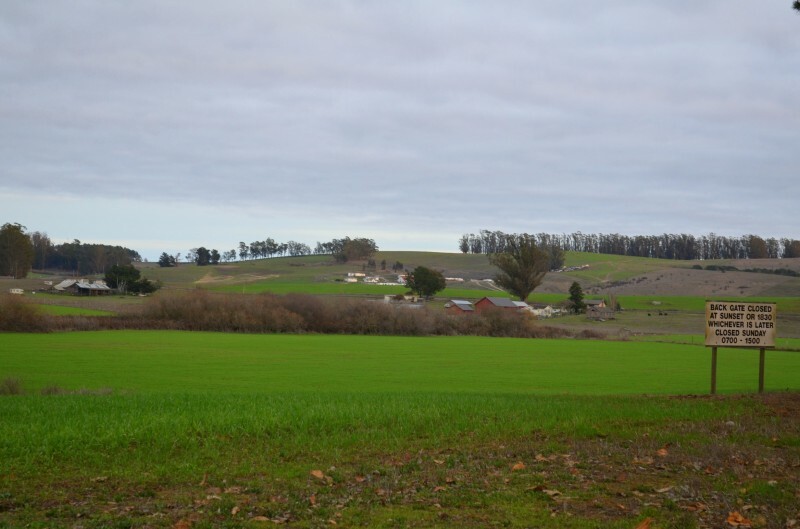 Take Washington Street exit off US 101, proceed west through the City of Petaluma. After passing the Chamber of Commerce building on the right, continue 8 miles (Washington Street will become Bodega Avenue). Follow the Coast Guard signs and turn left onto Tomales Road. A flashing amber light marks the main gate. Turn left through the main gate and immediately turn right and go around the building. Stop at the gate. When directed to leave the gate area, turn right and go straight on Pennsylvania Avenue. Park at the helo pad on the left past the gym since there is no big rig parking permitted in the gym area. Campground check-in is at Building No. 250, called "The Hub". You can go to the campground and get a site, then return for check-in. Proceed down the hill on Colorado Avenue until you get to Missouri Ave where the large propane tank is. Turn left, then stay right onto Wisconsin Ave. Take Wisconson Ave. until it hits Pennsylvania again and then turn left. The campground will be on the left just after the playground. Accepted no earlier than 90 days in advance. Reservations can be made 8AM-10PM (PST), 7 days a week. Free WiFi available at the campground and available at the library during the day (closed Sundays and holidays) and after 1700 at the club. Declare your pet. Usual leash and clean-up rules. Guests pay double price. Dump is located 1/2 mile away from the park. From RV Park, turn Right onto Wisconsin Ave. Got to end , then turn right onto Colorado Ave. Dump is near corner on right. Maximum 2 week stay, then out 1 day. Campground check-in is at the MWR library. Softball, Volleyball, Horseshoes, Archery, Dining Hall (all can eat). Retired are allowed to dine. 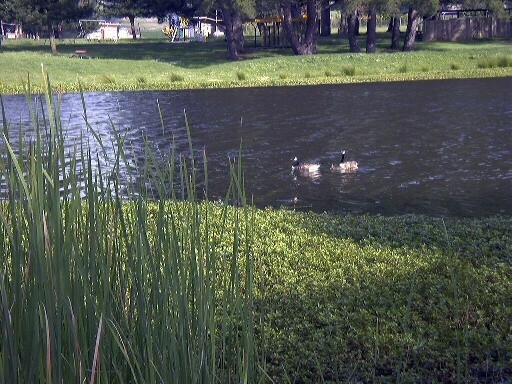 Beautiful little park with lots of geese roaming around! Sites are large concrete pads that are not level. We scored the one 50A site in the campground, which is the first on the left as you enter. I'm guessing the others avoided it because it's closest to the playground, but that was heaven for our boys! The rate has increased to $25/night for authorized users and $50 for guests. On base gas was more than 40 cents cheaper than Petaluma. Just under 1 hour from our RV to the Golden Gate bridge; 1:10 to Chinatown. When heading to 101 south, the GPS will route you another way that will bypass the town. Don't miss the Petaluma Creamery if you want locally-made cheese and ice cream. A small clarification to the directions: the road by the propane tank is now called Wisconsin Ave, and though the directions stop there, you follow Wisconsin until it hits Pennsylvania again and then turn left. The campground will be on the left just after the playground. We would absolutely stay here again if in the area! Gorgeous rural setting!!! Minutes from 101 yet zero noise! 45ish mins from San Fran. 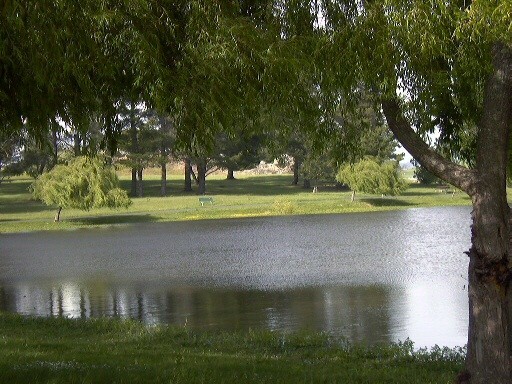 Pretty lake, wild turkeys lounging in the shade, deer wandering around. Water, electric, & cable. WiFi is a little slow but I am getting it at my spot. $20/night is a pittance for the beauty here! Easy to navigate, small base with clear signs, flat concrete spots that are actually unlevel (can't see it by looking) w/ firepit & nice picnic tables & shade at our site), park next to us, best part is a kids afterschool center behind us. My fulltime rving kids were thrilled! On post is a movie theater, a small exchange, bowling alley, pizza place, & bar. Showers are at the gym. Will DEFINITELY return here again! 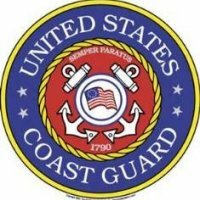 We just returned from two nights at Petaluma Coast Guard Station. Once on the base, this website here provided some vague direction that I would like to see clarified a bit. "Proceed down the hill on Colorado Avenue until you get to Missouri Ave where the large propane tank is, on the right where the sign says Lake Recreation Area. Turn right on Missouri Ave." Was fun. Very quiet. Only six spaces and five were occupied. 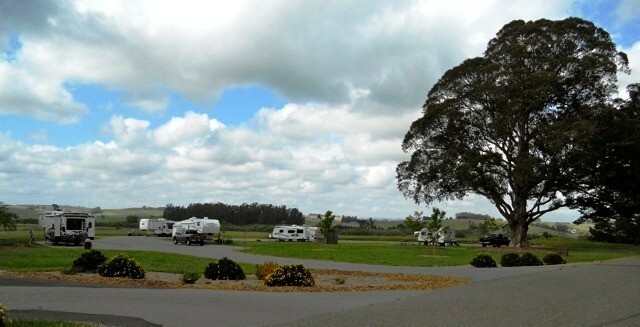 Rarely saw anyone out and about The pads are well spaced out on the circle of the campground. I had a tough time leveling, despite what looked like a pretty level concrete pad. No sewer hook ups. Thirty amp hook ups. 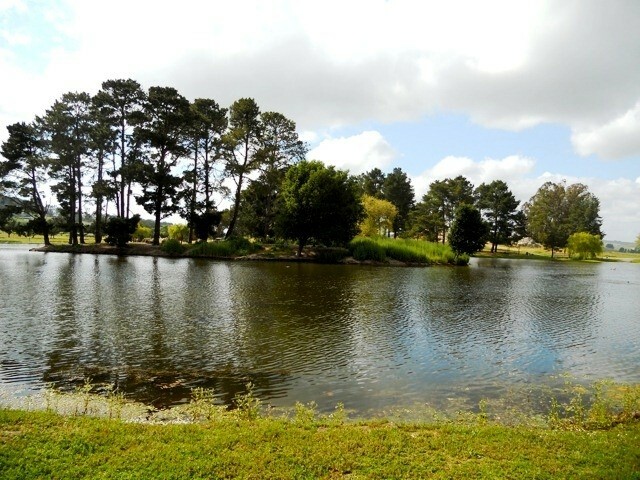 The pond is cute, catch n release for the fisherman. Canadian geese have made a mess of the place, watch you step. A little bit of landscape work was going when we were there. Slight smell of cattle, but not that strong. Flies, so be sure you close the door behind you. We used the dining galley on the first evening, $7.70 each. It was good Italian meal. The Coast Guard runs their Food Service Specialist school here, so you are eating the rewards of the students "coasties" good work. They all look so young. There is some sort of agreement with the civilians managing the galley. MWR told us the lunches are the best meals of the day. Missed them. The MWR is located in the "HUB" which was hard to find. Building NEXT to the gym. The hub has a lot going on, ITT office, library, activities, and there is a coffee shop/snack bar on the end. We went to Bodega Bay for the day, 11 miles away. When leaving the base back towards Petaluma, traffic to Southbound Hwy 101 is routed a different way. Pay attention to the signs about 2 miles East of the base. Will go back. 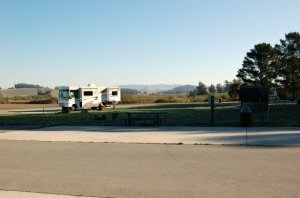 We are new to RVing so I do not have a lot of experiences to compare this trip to. We enjoyed the park very much. It is quiet and the spaces are very spacious. There are only 6 spots, but they could have made double that amount. 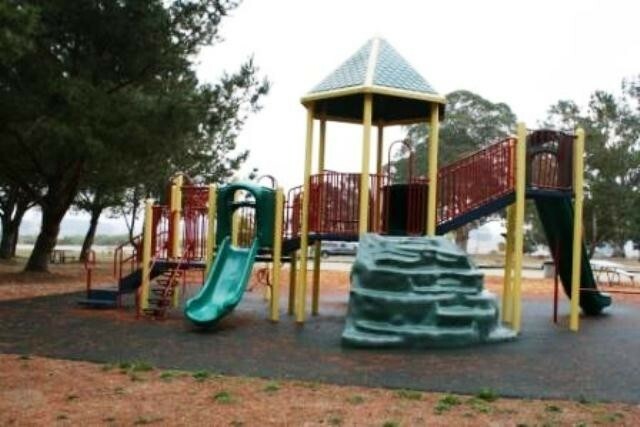 If you have younger children with you there is a really nice playground with and a horse shoe pit. Bring your own horse shoes. 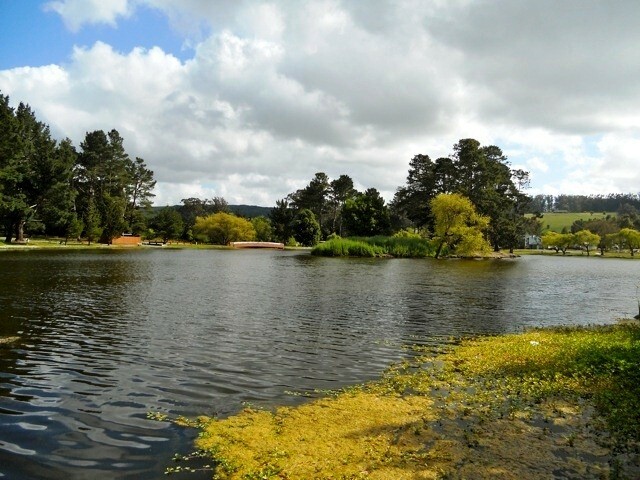 The lake is small and some might call it more of a pond. The Canadian Geese have taken it over so there is a lot of goose poop around it. Walk carefully. I also might add for those of you who do not know the area that This is pretty common in this part of the state. Those geese are everywhere. Each site has a nice fire pit and a table. Make sure to bring your own wood as there was none available on the base. The exchange is small and there is no commissary. The gym is nice and there is a nice coffee/sandwich shop with good hours. Religious services are available on Sunday. The base theater has new movies but you do have to pay. $4.00 per adult. (still a bargain in today's world). 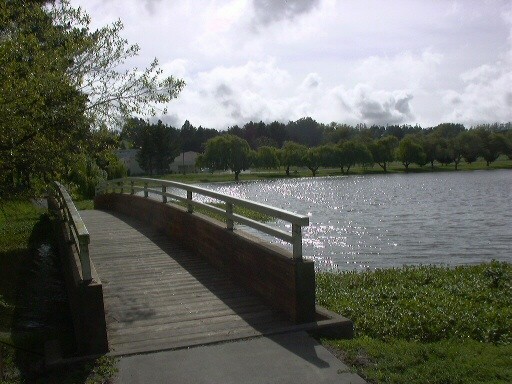 There are lots of trails on the base. This would be a good place to run, walk or ride a bike. We were able to use the dump station. Everything was in working order. Make sure to check the hours of the MWR desk. They close at 1:00 on Saturday and do not open again until 1:00 on Sunday. You need to check in or out with them, so make sure to make arrangements if you will not be there during that time frame. We will be returning. A really great experience. 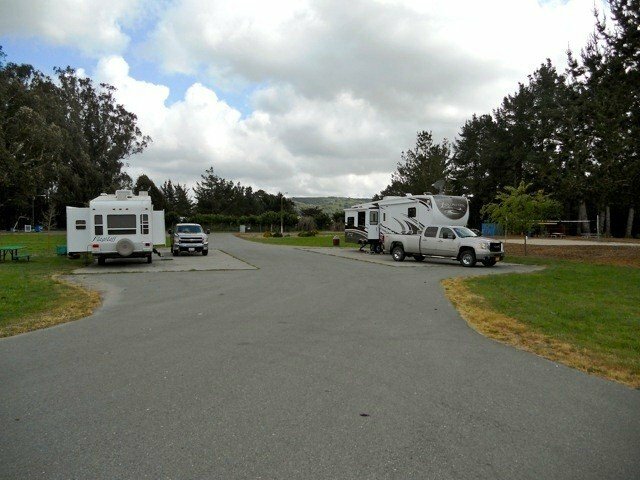 Great little campground in a central location for touring Point Reyes, Bodega Bay, Petaluma, and the Sonoma Coast. The base is a spotless garden, very quiet with small but nice facilities. 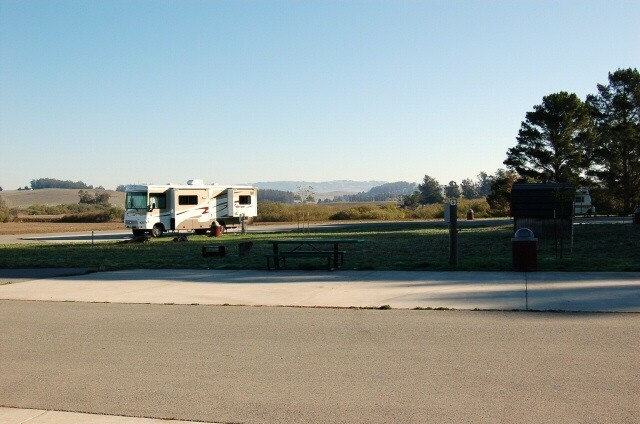 RV sites are large and come with picnic tables, fire pits, water & electric and nice views. The bathroom is across the road, small and clean but without showers. Showers are available at the gym. Note for 2014 the dump station is closed, no date for re-opening was given so come empty and be prepared to drive to the KOA if you need to empty your tanks. "Off the beaten path", but if you're looking for a quiet facility in a pastoral setting, this is it. 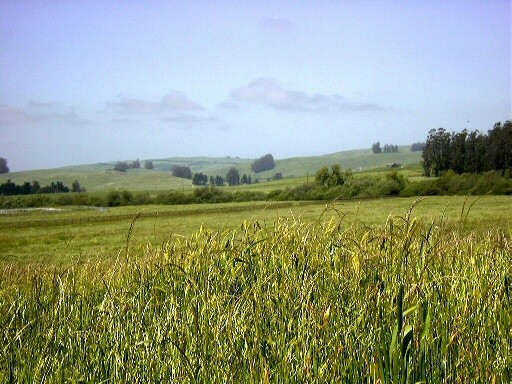 You're about 18 miles from Bodega Bay and 10 miles from Petaluma where there are nice restaurants and shopping. We came here in the worst rainstorm California has had in months, but set our rig up easily and were glad the sites are paved. Some bad news: If you camp in site #1, be aware that the fronds and small branches from the nearest trees will blow off during a wind/rainstorm and sometimes pelt your rig. 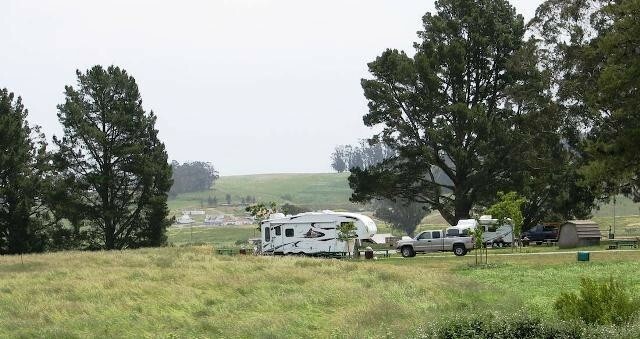 We also discovered that the base dump site is closed due to some major renovations on the base, so you will have to go back into Petaluma to a Union 76 station or a KOA campground and pay to dump. Some good news - the Base theater is nice and there is a nice coffee shop in the Hub where you register for your campsite. Also, the dining hall is open to retirees - you can pick up a weekly menu at registration but you have to ask. You can also pick up the discounted 3 day Park Hopper passes for Disneyland at the Hub. Six large sites (our pad was about 30 by 70) with lots of grass (mostly brown when we were there, but it was autumn) and trees nearby. Water and electric at sites. Bathroom (one-seater each for men and women) was very shabby but everything worked. No showers. Picnic tables, playground equipment and a pretty lake nearby. Lovely pastoral setting; saw horses, cows, deer and wild turkeys. Everyone we dealt with was helpful and professional, especially Jason. We had just paid $33 for a spot with no hook ups at a nearby CA state park, so $20 here was a bargain. Overall, very nice! What a great little place! If you are so fussy about hookups being on the wrong side of the sites and having to dump at a site on the wrong side of the road stay away and leave this beautiful site for those of us who enjoy the quiet rural scene. My grandchildren love it here and I feel safe letting them bike and hike around the base. At $20 I feel it is priced right, especially considering what some "famcamps" charge to park in what I consider to be parking lots jammed in with your neighbors. The Coasties have done a wonderful job creating this really neat campground. We stayed here on 23 and 24 February 13. Some might disagree but experience at military camps says this one is not worth the price. No sewer, except a dumpsite a good ways away. The utilities are on the wrong side of the trailer if you want your door to open to the side with the grass and table. The dumpsite is on the wrong side of the road to access it properly. You have to turn your whole rig around in a parking lot to access it properly and still you are parked on the left side of the road to use it. There are no showers at the park. The restrooms are not heated. As said before, there is goose poop everywhere. The CATV only works if you have a digital TV. Over seventy five percent of RVers have rigs older than 2008 when they started putting in digital TVs. The fellow at MWR is very friendly and thinks they have the latest and greatest but he doesn’t have a clue. He tried to compare them to KOA but there is no real comparison. KOA charges more but they offer much more too. The only redeeming feature is that the Wi-Fi does work pretty good. No way I will go off the road that far for so little again. While not exactly close to San Francisco it was perfect for what we needed. 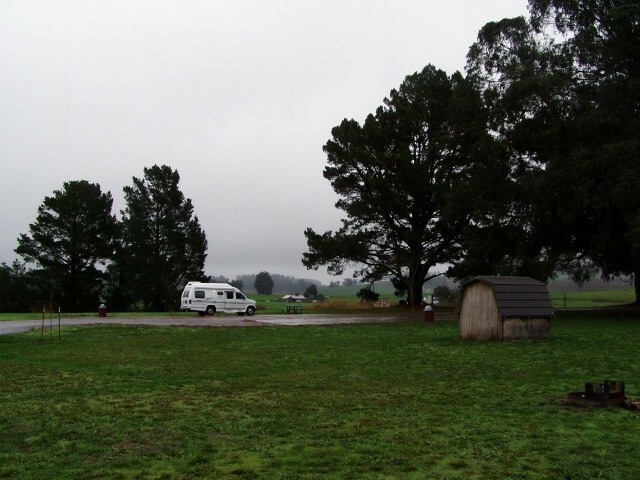 There are six spots in a horseshoe that were plenty big enough for my motorhome and trailer with space left over to park the car and motorcycle. The staff at the MWR were very friendly and competent. I will stay here again if in the area. This was our second stop with our new trailer and our second time here. The woman who checked us in this time was a bit rude at first. But after a bit of joking with her she opened up. I still prefer this family camp to the others we have been at. This is a RURAL base set amongst many dairies. If you can’t handle the “smell” of live stock in the area then go to Travis. This is a perfect spot for families with children. There’s the playground area which was perfect for our now 28 mo old granddaughter. The free movies on Friday night are also a plus. The library has a wonderful area for young children to sit and read or be read to. You can take a book to read (bring back of course). 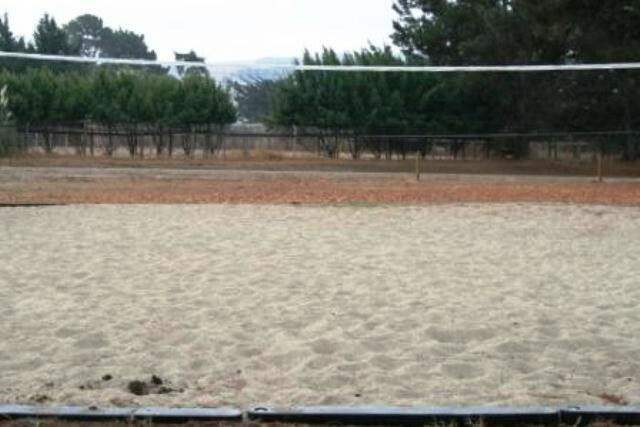 You can swim in the pool, fish in the pond, play volleyball in the sand or horseshoes. Once the gym is finished you can shower there and you will be able to rent bikes and some other equipment. The kids from base housing are very polite and helpful. Since school is out they are there every day for a couple of hours. There are kids of all ages to play with. If kids bother you Travis might be a better fit. It’s sterile and does have everything you would need. It's about 50 miles to San Francisco, 20 miles to Bodega Bay or 55 miles to Travis. If you need diesel the cheapest is at Valero 910 Baywood Dr., Petaluma - they do charge more for credit but is still the cheapest. From North bound 101 take the 116 Sonoma/Napa exit stay in left lane to turn for fuel or right lane to take you to Washington St. Turn left at 1st intersection, station is on right. Base does not have diesel. Welcomed by rudeness upon checkin at 1630 although closing for checkin not until 1900. Sites and view was beautiful once you got passed the smell of goose droppings all over. It was like walking in a mine field and the geese took us as invaders. The rolling hills and abundance of deer and turkey was nice but lack of facilities and the stench was a turn off. No wonder it was easy getting into the CG on a half days notice. Our companion campers were the only others there. The CG is very quiet and isolated near the rear gate. I don't consider it a good value at $20 a night for 30 amp, water and WIFI when there are no showers or laundry room. The entry into the base is fairly simple as long as you have a DOD sticker and ID, otherwise you will need to fill out paperwork and get a visitors pass. The seem to take security very serious, which is a good thing. Overall we did not enjoy the experience here and would not return by choice. 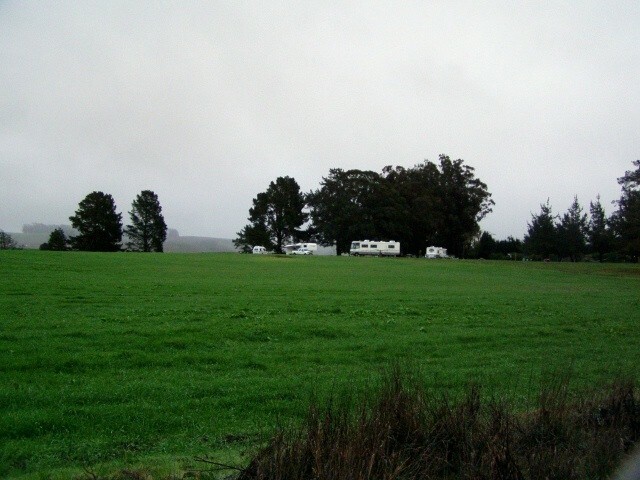 This was our 2nd visit here - we love the peace and quiet yet it's still w/in easy traveling distance to San Francisco. Be sure to enjoy one of the meals in the dining hall - a bargain at $2.30/pp for breakfast and $4.25/pp for lunch or dinner. The meals we had there were fabulous - you can't fix that feast yourself for that cost. One word of advice about getting your mail delivered there. The folks where we checked in weren't sure where it would be delivered but sent us to the base post office which has limited hours. When we caught up w/someone there, they told us mail for the famcamp guests goes to the mail room, which is right next door but is only open one hour a day during the week and not at all during the weekend - hard to catch if you want to be out and about sightseeing. Having laundry facilities nearby would be a major plus. Dump station on the wrong side of the road but you can turn around either in the gravel lot next to it or go down that road a bit and turn around in the large parking lot. Next time we are in the area, we'll definitely return. Very nice campground. This is our second visit to the base and won’t be the last. A lot of landscaping has been done since our last visit. New playground for children. Rate has increased to $20 a day; a little steep for sites with no sewer hookups. Site #6 now has 50 amp electric with all the others having 30 amp. Dining facility is open to all. When you check in they will give you a dining schedule and menu. Lots of goose poop everywhere. 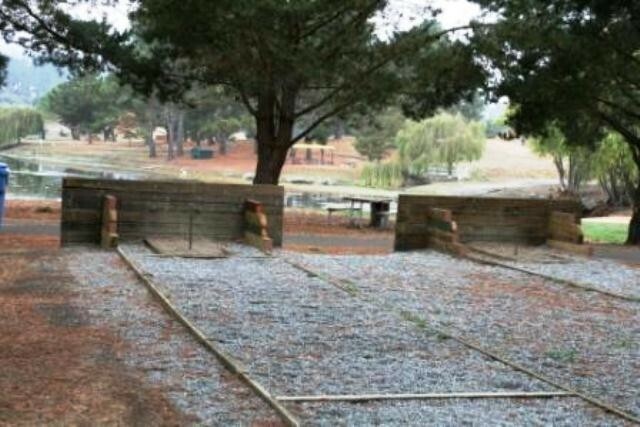 The Coast Guard is in the process of landscaping on the base, and this includes at the Lake Area campsites. The fire rings now have a defined circle around them mulched with wood chips. There are new trees planted in the area. When complete, and in years to come, these efforts should make the campsites more appealing. Registration is now accomplished at the MWR Library, and the clerk told us he was open until 10:00 p.m. We managed to visit the "Two Rock Pizza" Thursday evening for dinner on the patio. In addition to pizza, they have a selection of burgers and other sandwiches. We watched two deer grazing on the lawn while we ate. We have visited this base several times, and have yet to find a grump on the base! Everyone we deal with is very friendly and courteous. I held out one star on "Amenities/Facilities" because of the lack of a sewer hookup on the sites. We enjoy the peace and quiet and watching the deer, wild turkeys, geese, and other wild life. We'll be back. We borrowed a friends’ trailer (1984 - 24’) to find out if we like trailering. Was our first time to try a trailer & 1st time to stay at a FamCamp. We stayed here for 3 days with our 19 mo old granddaughter and had a great time. We arrived on Sunday, they had only 1 spot left. Monday 3 left, Tuesday 2 left with no new arrivals. We left on Wednesday for the Monterey FamCamp. The playground equipment was great for keeping our granddaughter entertained. We were very impressed with the facility and will definitely be back. We are still at this great place. If they could add another 30 sites, it would be a great boon to the military RV community. 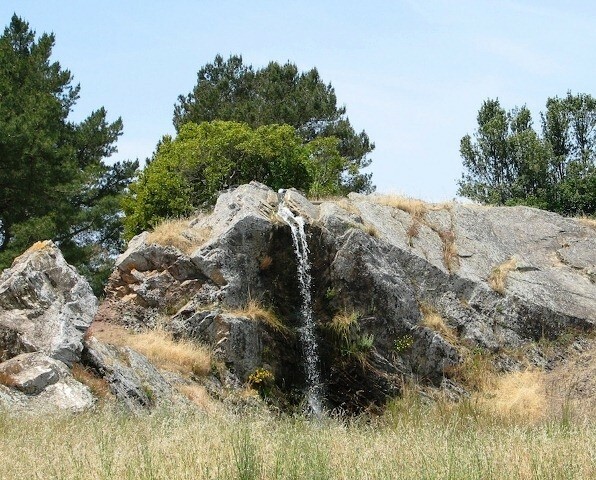 A great jumping off point for touring the area, from San Francisco, to Bodega Bay and points North on CA-1. There is no way I would want to do CA-1 in a motor home or large RV trailer. There are signs posted that tandem axle over 30 ft in length should avoid portions of the highway. The gym is the place to check in with. A little clarity on the directions once on-base. There are two entrances to the old helo pad just past the gym on the left side, and recreation parking lot mentioned. One is on Pennsylvania Ave, and the other is on to turn right on Colorado Avenue and enter there. The one off of Pennsylvania Avenue is a sharp turn and a down hill drive onto the parking lot. We exited there as you will need to travel down Colorado Avenue and turn right on Wisconsin Avenue. The helo parking lot is large enough to U-turn if there are no vehicle parked in there. Either exit is doable. Travel to the end of Wisconsin Avenue to the stop sign. This will be Pennsylvania Avenue again. 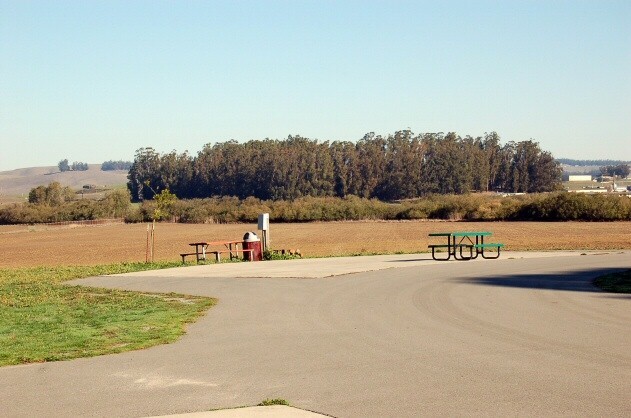 Turn left, and just past the picnic area is the horseshoe driveway for the RV park. As to the galley food, we have found it excellent so far, and I doubt if we will be disappointed. All of the personnel and staff have been very friendly and helpful when information was needed. I gave the amenities a 4 rating because of the lack of sewer connection. Everything else has been great. We stayed here in a motor home and would return again. 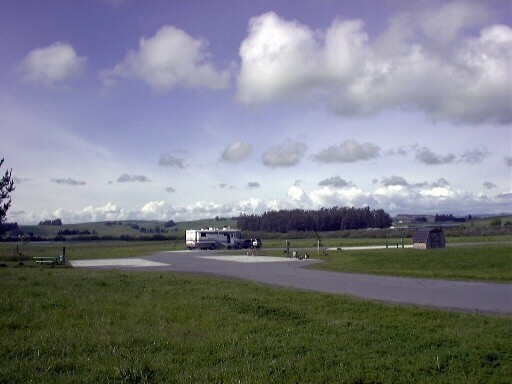 This base in a pretty country-side setting among rolling hills and farmland about 8 miles west of Petaluma. It was very quiet with deer and wild turkey roaming the area. The base is relatively isolated yet it does not have a commissary or exchange - just a small mini-mart. We came to visit Point Reyes National Seashore which is 25 miles away. There is no parking at the office in the gym - had to park at helo pad about 200 yards away for check-in. Only 6 sites, with 30 amp and no sewer. Overflow is no longer available. All 6 sites were reserved for the weekend so I had to leave after 2 days. Dining is available at the chow hall but I was a little disappointed in the quality of food. They ran out of some items halfway through serving hours. But you can't beat the price. I thought that $16 was a bit high for 30 amps and no sewer. I had just left the FamCamp at Travis where full-hookups with 50 amp and sewer and a full selection of cable TV was $17. And a large exchange and commissary were just blocks away.